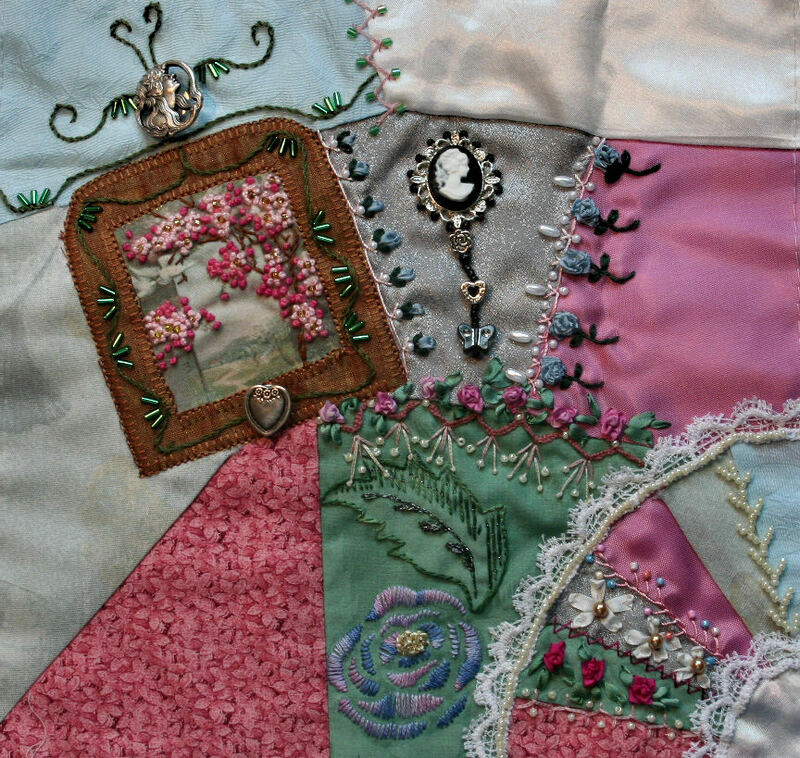 More embroidery was added to my crazy quilt block last night. There is something about watching Project Runway that gets me inspired to sew. 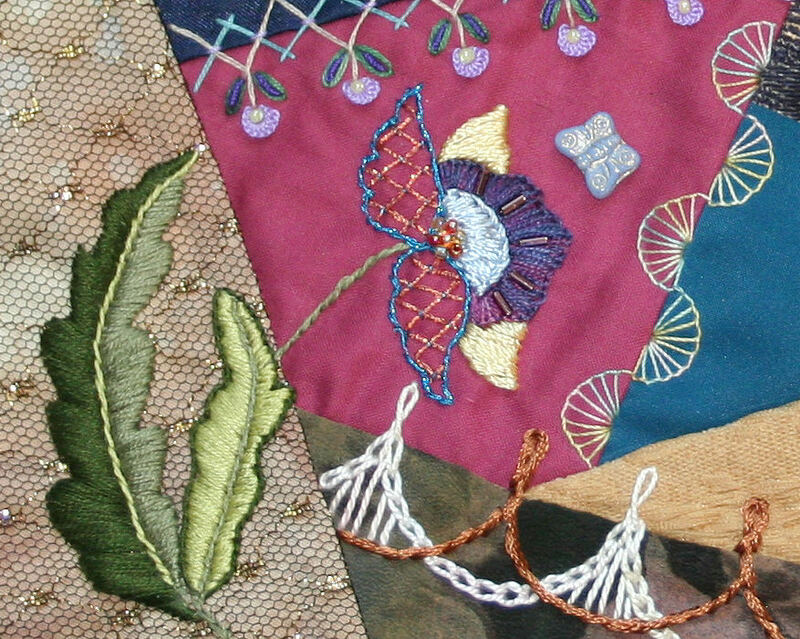 I love the free form silk ribbon branch at the bottom left, but it doesn’t flow very well into the crewel embroidery. This picture isn’t terrific, but I did use some of the same color floss used in the crewel leaves to shade the silk ribbon. Something needs to be added to that area, but I’ve smack dab run out of ideas. Any suggestions would be deeply appreciated. An additional seam treatment was added too. Light yellow silk ribbon was folded and held in place by lavender floral shaped buttons. They have a touch of gold on them. The top portion of the seam is a lazy daisy stitch with an opaque beadlette used for the center stitch and my hand dyed silk thread in shades of blue for the rest of the stitching. 3 weeks of embroidery and 3 more to go. The class was 6 weeks long and I want to see what I can accomplish in the same time frame. I’m quite pleased with the motif – even though I strayed a bit from the traditional crewel look of having one side of the leaf be padded satin stitch and the other an open embroidery design. 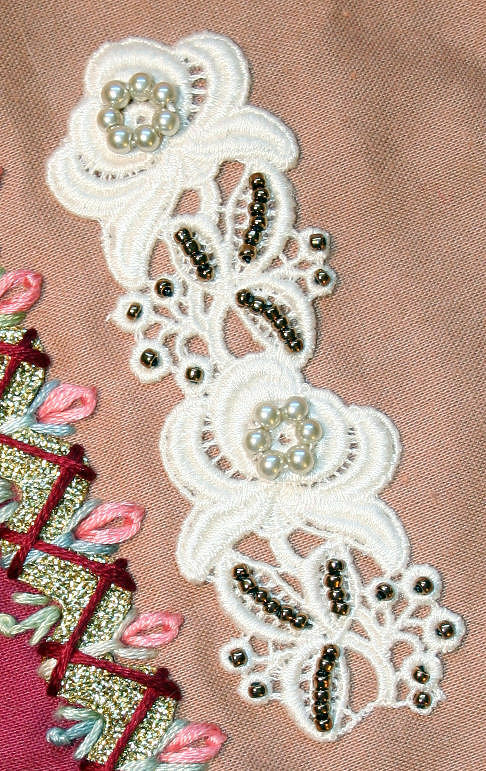 The trellis stitch or scattered French knots did not look well against the netted background fabric, while it’s nicely visible in the flower section against the solid color. I also placed a little butterfly bead in the area. It’s not sewn into place yet as I don’t know if I’ll like it there or under the flower. It depends on what seam embroidery I add to the netted fabric. I am really enjoying working on this block. There are still 2 more days in this week and then I’ll consider myself halfway through the course. Nothing like being behind. 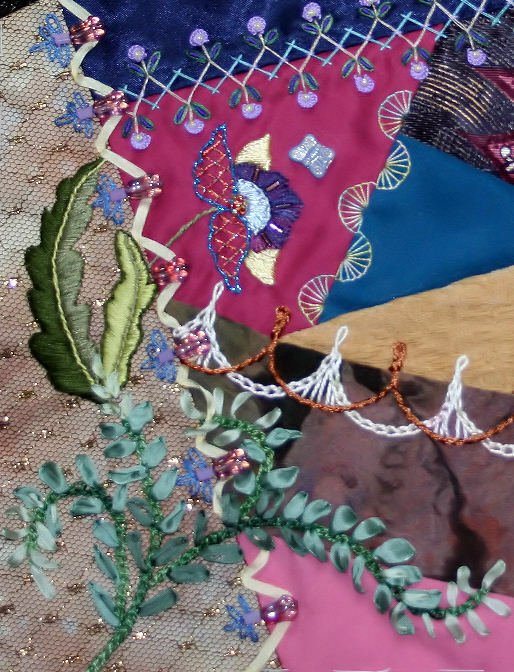 The last lesson in my Encrusted Crazy Quilt class was received yesterday. It’s hard to believe the class is ending. I really only worked on the lessons for 2 weeks – out of the 6 week class – the first week when we pieced the block, and then this past week. I’m pleased with what I added to the block and I’m going to continue working on it and posting progress reports every so often until it’s finished. No promises are being made that it will be completed in another 4 weeks though. I’m in too many round robins, have a lot of fabric and thread dyeing to accomplish next month, am working on a quilt, and a new sweater design. The lace motif was made on my embroidery sewing machine with 100% 2-ply 60wt silk thread and is one of the Zundt designs my husband purchased for me for my birthday last May. I do so love those Zundt embroidery designs. The motif was embellished with bronze colored glass seed beads and pearl beads were added to the flower centers. I’m thinking about adding a little butterfly in the corner or a dragonfly with a spiral bead trail at the base. It’s awfully close to the seam line, so it might be left as is. Motif time – happy days. I love motifs. There is something wrong with where this one is placed though. It was originally going to be in the upper right corner with beads dangling down and across the rickrack seam, but it didn’t look right there. I moved it to the cream fabric with the gold netting over it, and it didn’t look right there. Moved it to the black fabric in the upper left – as shown in the picture – and the color is great for that area, but it still doesn’t look right to me. I posted the picture – even though I know that tatted heart motif won’t stay there – because I wanted to share how I audition motifs. If it’s right for the area, I can tell immediately. If it’s not, I don’t try to make it fit. Yes, I spent a couple of evenings tatting the motif, but if it’s not used on this block, it will be exactly right for some future project. Nothing is ever wasted and I thoroughly enjoyed making this motif. My tatting skills are improving and it’s easier for me to read a tatting pattern now. On to auditioning some different motifs, or maybe embroider the silk ribbon garland in the bottom right, then build from there. Third day, third seam, and this one will be the last for a bit. The reason? I was going to put a motif in the corner and this third seam ended up being more dimensional that I thought it would be. Oh, I love the seam, but now my 3 motif plan is out the window. Does that bother me? Not really. It’s more fun working on a block that slowly evolves. As each section of embroidery is added, the block reads a bit differently. That might sound funny, but for me, just about anything that is created, has its own voice. No, I’m not hearing voices. It’s an instinctual feeling that this piece of fabric, or that button, that shape, etc… is just right for the piece, and it’s very obvious when something is horribly out of place. Sometimes a piece is quiet for awhile. It’s not ready for the next step. Sometimes, a piece won’t shut up and it keeps you up at night. Just ask my husband. I went to bed at 2 am this morning because this third seam just had to be sewn. Isn’t it pretty? It’s totally different from the other 2 seams – more dimensional, metallic, and bright – just like me! 😉 I’m more ample than I used to be, have shiny braces on my teeth, and eternally, cheerfully, optimistic. Yippee, I found my style. This seam started with a length of gold metallic rick-rack, couched in place with variegated DMC cotton using the fly stitch. Then couched again with a ruby red floss using the herringbone stitch. The pretty pink flowers are double detached chain stitch, and the other side has a center pistil stitch flanked by 2 straight stitches. 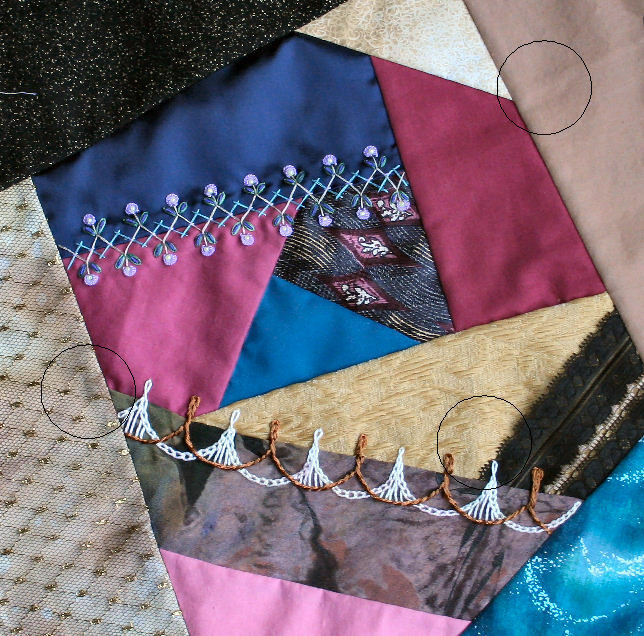 Another day, another seam treatment on my crazy quilt block. This one started with a curved chain stitch and a twisted chain stitch tip out of DMC # 5 variegated cotton thread, overlapped with a stem stitch curve with a chain rosette tip using 6 strands of DMC rayon floss. It was a bear to get those threads through the fabric. I had the correct needle, but by the end of sewing that seam my thumb and hand were mighty sore. I much prefer using thinner threads and building an embroidered seam with multiple stitch combinations. Plus I think it’s a bit heavy looking for the block and think it will need to be blended in somehow. I love the look of DMC # 5 though and will use it as a thread to be couched in place. It would make a nice meandering vine or a great tree trunk. This picture also has 3 black circles on it. I was thinking about adding a motif in each area. One would be a beaded fan (I think the upper right circle), the bottom right circle would look nice with a silk ribbon embroidered curved garland, and a tatted something or other for the third. The motifs would be larger than the circles, and I’d love some input as to whether I’m placing them in good spots. 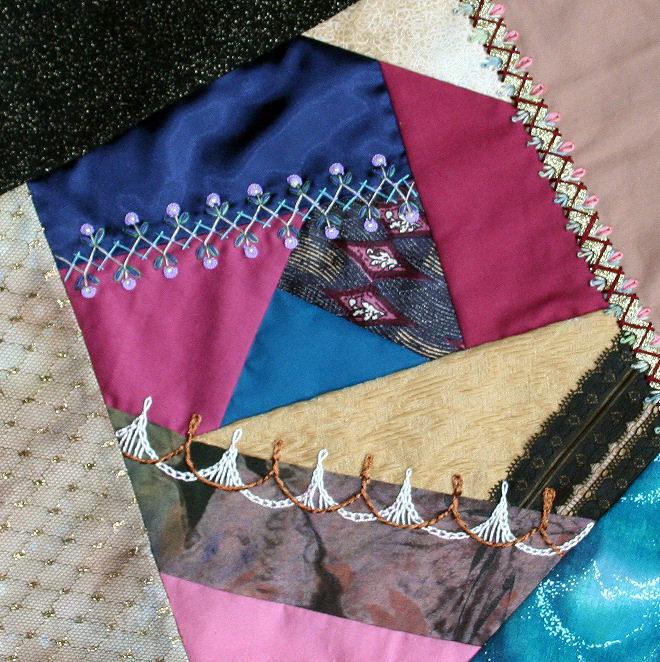 I’ve been a sluggard about working on my Joggles Encrusted Crazy Quilt class block. Sharon (our fearless leader) had to leave home to help care for her very ill mother, and I did not want to bother her with a lot of questions. She was really great and maintained computer connection the entire time she was away from home, but I was uncomfortable about placing any demands on her time. She’s back home and now I’m in full class mode!!! My first seam is completed and I had a great time making it. It’s very close to a seam Jackie (from the crazyquiltinternational yahoo group) shared with everyone last month. She was smart and used 2 little straight stitches in V formation to tack down the cast on stitch (the light lavender flower). The looked like little pistils and even had some little French knots at the tips. I like the added texture of the flowers standing up a bit from the base fabric and stuck with using the center bead alone to anchor the flower in place. I know what my next seam treatment will be and am starting to plan motif locations. This is such a great class. I’m learning a lot and having fun. Once I got started working on Peggy’s block, it was hard to stop. My contribution is completed and here is a close-up of what I’ve done. 1 – Herringbone stitch with 2 strands of rayon floss, couched with a gold Sulky 30 wt cotton, and a deep ruby bead on each tip. It’s really hard to see the gold thread at the tips, but it does show up in person. 2 – The flower and leaf sewn as mentioned in yesterday’s post. 3 – Silk ribbon embroidery on the fan – feather stitch thanks to all the gorgeous samples I’ve been seeing of that stitch on the crazy quilt international list, and loop flowers sewn in place with very light yellow beads. 4 – A silver metallic trim that is sewn into place with a variegated rayon yarn. The yarn is light aqua, rose, light blue, and light gray with a black wrap. 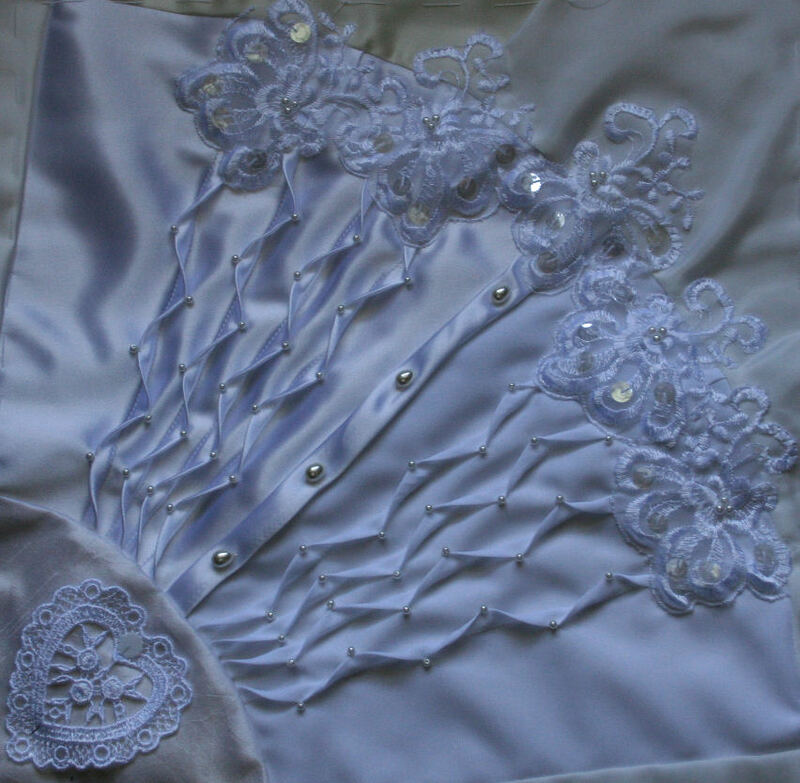 The raw edges of the fan fabric were not totally covered by the lace and beads, and I wanted to make sure it wouldn’t ravel on Peggy, so the extra trim was added and I really like the effect. It adds more detail to the edge and I find I like the layered trim look. It’s something I’ll use often now. I had a lot of fun working on this block and I learned a lot. It’s a good thing, because I signed up for not one, but two new crazy quilt block round robins. Stumpwork and hearts, here I come!!! Peggy’s block (from the FFT’s Round Robin) has been on my dining room table for almost a full month, as I’ve been stuck with what I should add to the block. The mailing date is fast approaching, so it is time to get embroidering. After complaining about being stuck on the crazyquilt international list recently, I got an idea of how to get unstuck. Venting must do me good, because as I was typing about my frustration, the solution was making itself known. Paint Shop Pro to the rescue. I took a photo of the block and used the dropper tool to get the hex number. Then I went to the color wizard – http://www.colorsontheweb.com/colorwizard.asp – and typed in the hex number. I set the color, then selected the complimentary key. Hmm, good contrasts, but a bit too strong. Split-complimentary might be better, so I selected that next and voila!!! There were the colors that I’d use in Peggy’s block. The piece of fabric I embroidered was the green one. I added a stem stitch leaf with variegated greens. I wanted the leaf to blend with the fabric, but it needed a little pizazz, socouched some of the straight stitches with a metallic black/grey thread, and also sewed the center vein with the metallic, shading it with a bit of the green thread. The flower is another variegated thread and straight from the split-complimentary shades. The flower center has white/yellow rayon boucle stitching with white/gold metallic French knots. It’s subtle, but the metallic reflects the light beautifully. 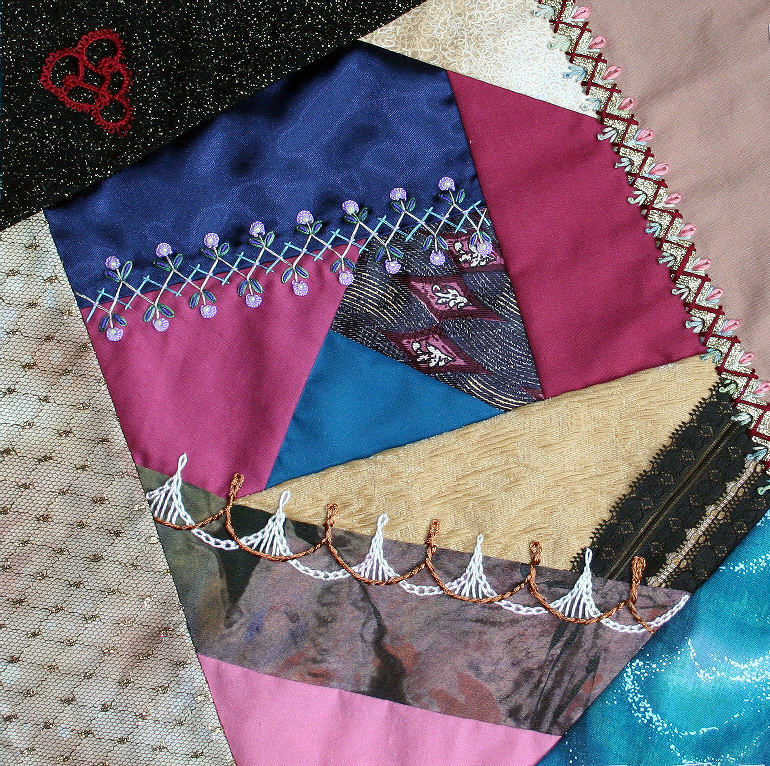 The crazy quilt block I’m making for http://www.makingmemories.org/ is finally pieced. The beads on the twisted fan pleats are sewn in place. 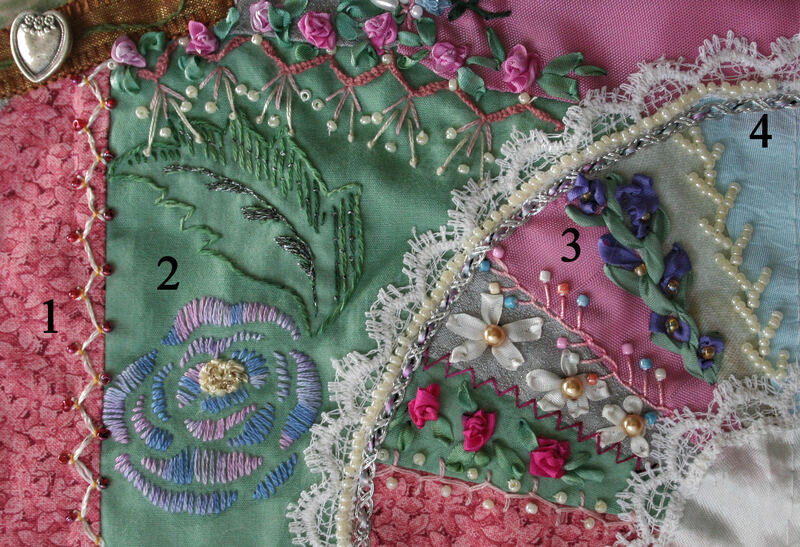 The heart motif and central beads are pinned in place and will have additional stitching – maybe a nice chain stitch in the center with those larger pearl beads nestled inside every 3rd or 4th stitch, and I think the heart would look nice with a silk ribbon floral outline.. The sides need some stitching also – something like scattered delica glass beads or scattered seed stitch. That would fill in the blank space, and add subtle texture, but not detract from the fan. Much as a I love the encrusted look, I’m not too sure a lot of heavy, dimensional embroidery would enhance this block. The center beaded fan is a strong focal point, and I like it that way.